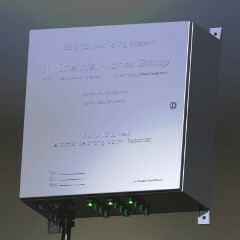 The Terrascience Systems' 24-bit Acquisition Unit (TSMA-24™) is a true 24-bit precision digital data acquisition system. It is a part of Terrascience Systems’ line of 24-bit microseismic and strong motion monitoring products, which draws upon more than thirty-five years of industry experience. Multiple units can be connected in a single network covering large areas for both temporary and permanent arrays of sensors. The TSMA-24™ is specifically designed to be capable of communicating with Terrascience software packages for data analysis including the AutoTAR™ and MicroView™ using either or TCP/IP, fiber or a wireless link. The TSMA-24™ is designed for high performance geophysical data acquisition applications. The standard configuration consists of 12 channels of 24-bit A/D modules in 4-channel increments. Each channel employs an exceptionally low noise 4th-order Delta-Sigma modulator together with a programmable digital filter. This gives an effective noise-free resolution greater than 23 bits at 250 samples per second. Each TSMA-24™ is capable of running its own GPS module and saving up to 64 GB of data on a non-volatile flash internal memory. The GPS module generates one pulse per second that is used to time stamp each data reading with a precision of better than ±40 micro seconds. A single common clock drives all the A/D converters as well as a precision synchronization circuit. This design ensures that all of the A/D converters are sampling simultaneously, resulting in zero channel skew. The TSMA-24™ is capable of multitasking and supports simultaneous data acquisition and communications. For critical applications, TSMA-24™ can be equipped with an internal rechargeable battery to avoid any interruption of data acquisition during power outages. The TSMA-24™ is housed within an IP67 stainless steel enclosure. This corrosion resistant enclosure provides a stable platform that may be easily deployed in harsh environments.